Effective September 7, 2016, the Supreme Court of British Columbia has suspended all access to the UBC Okanagan campus via the Curtis Road private easement west of campus. Until further notice the use of the private easement to access the university campus is prohibited. Access to campus via the private easement was scheduled to be closed upon the start of construction of John Hindle Drive later this fall. The Court ruling has moved that closure date ahead, and is effective immediately. The City of Kelowna has opened the Bulman Road multi-use pathway, providing cyclists and pedestrians a safer direct link to UBC Okanagan from Highway 97. The four-metre-wide pathway connects the Hollywood Road/John Hindle Drive roundabout to Bulman Road on the opposite side of Highway 97. This connection allows cyclists and pedestrians to travel under the existing Ellison overpass on Highway 97, and also intersects with the future Okanagan Rail Trail corridor. 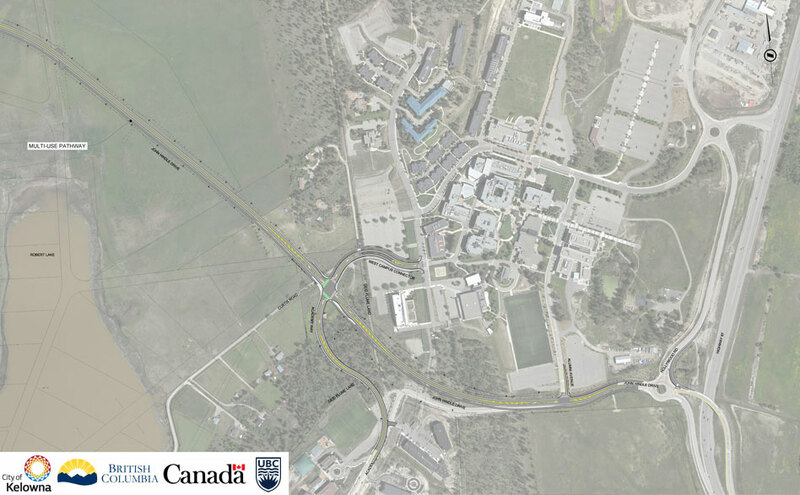 The City of Kelowna is preparing to build a 1.6-km section of John Hindle Drive, a public road connecting Glenmore Road with Highway 97 via UBC’s West Campus. The City construction project will consist of a two-lane roadway and a multi-use paved pathway for pedestrians and cyclists. This project’s construction will impact access at the south end of campus, between the Reichwald Heath Science Centre, Gymnasium and the University Village development. The City of Kelowna’s plan includes an 11m (35ft) excavation to allow for the road alignment, which will impact pedestrian and cycling access from the south and west sides of campus. 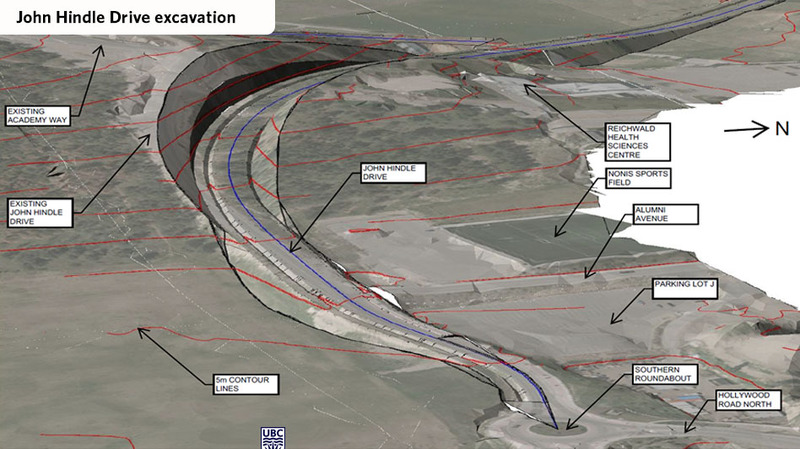 Once construction begins, those cyclists and pedestrians currently using the Glenmore-Ellison Improvement District Flume Trail will no longer have access via that informal route. Cyclists and pedestrians are reminded that the BC Supreme Court has ordered that as of September 7, 2016, no campus access is permitted via the private easement between UBC Okanagan and Curtis Road to the west. The City of Kelowna will be providing alternative pedestrian and cycling routes, and information about these will be communicated in advance of any changes. More information and project updates from the City of Kelowna are found at: http://www.kelowna.ca/CM/Page3478.aspx. 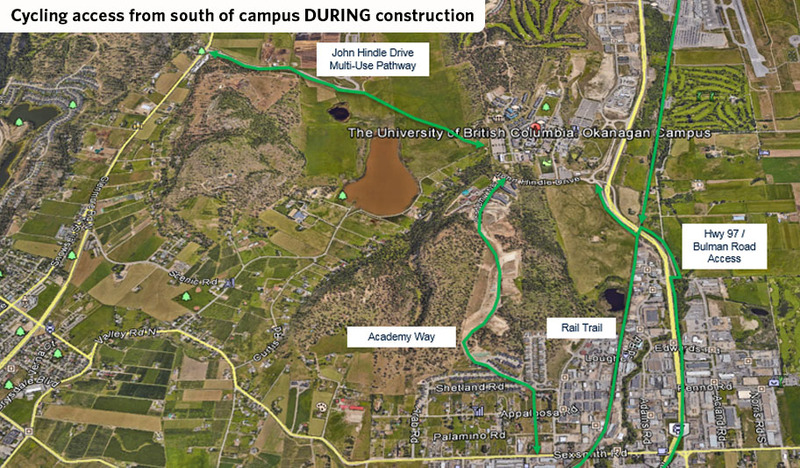 During the City of Kelowna’s construction of John Hindle Drive, access from the west side of campus will not be possible, as a result of the significant re-grading and construction activity taking place. Once construction begins, those cyclists and pedestrians currently using the Glenmore-Ellison Improvement District Flume Trail will no longer have access via that informal route. Cyclists and pedestrians are reminded that the BC Supreme Court has ordered that as of September 7, 2016, no campus access is permitted via the private easement between UBC Okanagan and Curtis Road to the west. During the construction period, cycling access to campus will be available further to the east along Academy Way, or via Bulman Road from Highway 97. The Okanagan Rail Trail pathway is also expected to become available but no date has yet been indicated by the City of Kelowna. 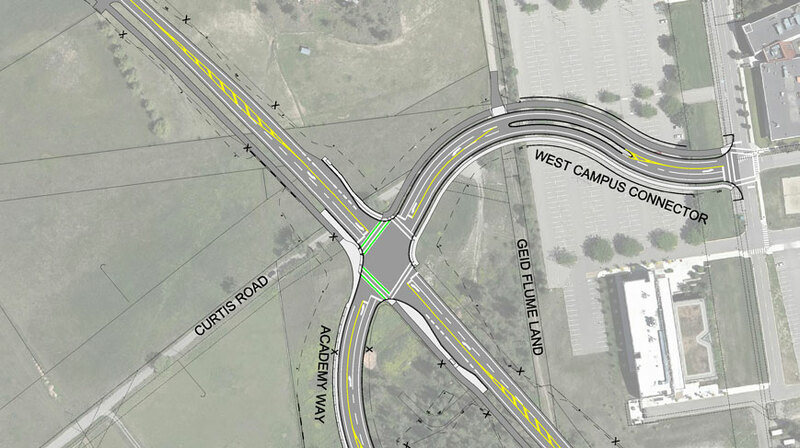 As part of the City’s John Hindle Road project, the university’s new West Campus Access road will be constructed, providing access to the west side of campus. The West Campus Access will be located through Parking Lot G. Loss of parking resulting from the new access road will be made up through the redesign and re-configuration of the parking lots to the north and south of the access road. Traffic patterns in the area will be assessed to help ensure pedestrian safety and ease of access. Construction of the West Campus Access will be completed in the spring and summer of 2017 to ensure that all construction activity is complete in advance of classes resuming in September 2017. Access to parking during the construction period will be limited in Parking Lots C, G & K and alternative parking locations will be identified for these months. It is expected that with lower traffic volumes in the summer months, there will be ample parking on campus. During construction of John Hindle Drive the existing pathway will be removed. Residents of the University Heights neighbourhood will be directed to a temporary pathway to the east to access the campus at Alumni Avenue during the first phase of construction. The informal parking that currently exists on the south side of John Hindle Drive will be removed by the City of Kelowna to make way for the temporary pedestrian access during construction. As each project progresses, we will provide updates information about any detour routes for pedestrians, cyclists and vehicles accessing our campus.